Farughi, H., Dolatabadiaa, M., Moradi, V., Karbasi, V., Mostafayi, S. (2017). Minimizing the number of tool switches in flexible manufacturing cells subject to tools reliability using genetic algorithm. Journal of Industrial and Systems Engineering, 10(special issue on Quality Control and Reliability), 17-33. Hiwa Farughi; Mohsen Dolatabadiaa; Vahed Moradi; vida Karbasi; Sobhan Mostafayi. "Minimizing the number of tool switches in flexible manufacturing cells subject to tools reliability using genetic algorithm". Journal of Industrial and Systems Engineering, 10, special issue on Quality Control and Reliability, 2017, 17-33. Farughi, H., Dolatabadiaa, M., Moradi, V., Karbasi, V., Mostafayi, S. (2017). 'Minimizing the number of tool switches in flexible manufacturing cells subject to tools reliability using genetic algorithm', Journal of Industrial and Systems Engineering, 10(special issue on Quality Control and Reliability), pp. 17-33. Farughi, H., Dolatabadiaa, M., Moradi, V., Karbasi, V., Mostafayi, S. Minimizing the number of tool switches in flexible manufacturing cells subject to tools reliability using genetic algorithm. Journal of Industrial and Systems Engineering, 2017; 10(special issue on Quality Control and Reliability): 17-33. Nowadays, flexible manufacturing systems play an effective role in a variety of production and timely response to the needs of their customers. Flexible manufacturing cell is a part of this system that includes machines with flexibility in manufacturing different parts. For many years, minimizing the number of tool switches in the machines has been studied by the researchers. Most research in this field has not considered the limitations related to life and failure of the tool. Therefore, it is necessary to provide a model that, because of restrictions on tool life, the number of tool switches for a flexible cell is minimized. In this study, the impact of the tools reliability on minimizing the number of tool switches is examined. First, a mathematical model is presented for the problem. Because of the complexity of the problem, the exact solution of the problem in medium or large sizes is not possible in a reasonable time. Therefore, genetic meta-heuristic algorithm has been used for solving the problem and Keep tools needed soonest (KTNS) policy has been used to determine the optimal arrangement of tools. Then, some examples of such problem have been solved to evaluate the performance of the presented algorithm. Adjiashvili, D., Bosio, S. and Zemmer, K., 2015. Minimizing the number of switch instances on a flexible machine in polynomial time. Operations Research Letters, 43(3), pp.317-322. Akturk, M.S., Ghosh, J.B. and Gunes, E.D., 2003. Scheduling with tool changes to minimize total completion time: a study of heuristics and their performance. Naval Research Logistics (NRL), 50(1), pp.15-30. Akturk, M.S. and Avci, S., 1996. Tool allocation and machining conditions optimization for CNC machines. European Journal of Operational Research, 94(2), pp.335-348. Al-Fawzan, M.A. and Al-Sultan, K.S., 2003. A tabu search based algorithm for minimizing the number of tool switches on a flexible machine. Computers & industrial engineering, 44(1), pp.35-47. Altumi, A., 2009. USING GENETIC ALGORITHM IN FMS PART ASSIGNMENT AND TOOL LOADING WITH RELIABILITY CONSIDERATIONS TOOL SHARING ALLOWED. Journal of Engineering Research (Al-Fateh University) Issue, 11, p.100. Amaya, J.E., Cotta, C. and Fernández-Leiva, A.J., 2012. Solving the tool switching problem with memetic algorithms. Artificial Intelligence for Engineering Design, Analysis and Manufacturing, 26(02), pp.221-235. Amaya, J.E., Cotta, C. and Leiva, A.J.F., 2010. Hybrid cooperation models for the tool switching problem. In Nature Inspired Cooperative Strategies for Optimization (NICSO 2010) (pp. 39-52). Springer Berlin Heidelberg. Bard, J.F., 1988. A heuristic for minimizing the number of tool switches on a flexible machine. IIE transactions, 20(4), pp.382-391. Buyurgan, N., Saygin, C. and Kilic, S.E., 2004. Tool allocation in flexible manufacturing systems with tool alternatives. Robotics and Computer-Integrated Manufacturing, 20(4), pp.341-349. Catanzaro, D., Gouveia, L. and Labbé, M., 2015. Improved integer linear programming formulations for the job Sequencing and tool Switching Problem. European Journal of Operational Research, 244(3), pp.766-777. Chaves, A.A., Lorena, L.A.N., Senne, E.L.F. and Resende, M.G.C., 2016. Hybrid method with CS and BRKGA applied to the minimization of tool switches problem. Computers & Operations Research, 67, pp.174-183. Colledani, M. and Yemane, A., 2013. Impact of Machine Reliability Data Uncertainty on the Design and Operation of Manufacturing Systems. Procedia CIRP, 7, pp.557-562. Crama, Y., Moonen, L.S., Spieksma, F.C. and Talloen, E., 2007. The tool switching problem revisited. European Journal of Operational Research, 182(2), pp.952-957. Crama, Y. and Van De Klundert, J., 1997. Cyclic scheduling of identical parts in a robotic cell. Operations Research, 45(6), pp.952-965. Crama, Y., Oerlemans, A.G. and Spieksma, F.C., 1996. Minimizing the number of tool switches on a flexible machine (pp. 191-223). Springer Berlin Heidelberg. Das, K. and Abdul-Kader, W., 2011. Consideration of dynamic changes in machine reliability and part demand: a cellular manufacturing systems design model. International Journal of Production Research, 49(7), pp.2123-2142. Das, K., Baki, M.F. and Li, X., 2009. Optimization of operation and changeover time for production planning and scheduling in a flexible manufacturing system. Computers & Industrial Engineering, 56(1), pp.283-293. Das, K., Lashkari, R.S. and Sengupta, S., 2007. Machine reliability and preventive maintenance planning for cellular manufacturing systems. European Journal of Operational Research, 183(1), pp.162-180. Ghiani, G., Grieco, A. and Guerriero, E., 2010. Solving the job sequencing and tool switching problem as a nonlinear least cost hamiltonian cycle problem. Networks, 55(4), pp.379-385. Gray, A.E., Seidmann, A. and Stecke, K.E., 1993. A synthesis of decision models for tool management in automated manufacturing. Management science, 39(5), pp.549-567. Han, B.T., Zhang, C.B., Sun, C.S. and Xu, C.J., 2006. Reliability analysis of flexible manufacturing cells based on triangular fuzzy number. Communications in Statistics—Theory and Methods, 35(10), pp.1897-1907. Hirvikorpi, M., Nevalainen, O.S. and Knuutila, T., 2006. Job ordering and management of wearing tools. Engineering optimization, 38(2), pp.227-244. Konak, A., Kulturel-Konak, S. and Azizoğlu, M., 2008. Minimizing the number of tool switching instants in Flexible Manufacturing Systems. International Journal of Production Economics, 116(2), pp.298-307. Konak, A. and Kulturel-Konak, S., 2007, April. An ant colony optimization approach to the minimum tool switching instant problem in flexible manufacturing system. In 2007 IEEE Symposium on Computational Intelligence in Scheduling. Laporte, G., Salazar-Gonzalez, J.J. and Semet, F., 2004. Exact algorithms for the job sequencing and tool switching problem. IIE Transactions, 36(1), pp.37-45. Lin, Y.K. and Chang, P.C., 2012. Reliability evaluation for a manufacturing network with multiple production lines. Computers & Industrial Engineering, 63(4), pp.1209-1219. Liu, P.H., Makis, V. and Jardine, A.K., 2001. Scheduling of the optimal tool replacement times in a flexible manufacturing system. IIE Transactions, 33(6), pp.487-495. Makis, V., 1995. Optimal replacement of a tool subject to random failure. International journal of production economics, 41(1), pp.249-256. Raduly-Baka, C. and O.S. Nevalainen, The modular tool switching problem. European Journal of Operational Research, 2015. 242(1): p. 100-106. Rodriguez, C.E.P. and de Souza, G.F.M., 2010. Reliability concepts applied to cutting tool change time. Reliability Engineering & System Safety, 95(8), pp.866-873. Sakhaii, M., Tavakkoli-Moghaddam, R., Bagheri, M. and Vatani, B., 2016. A robust optimization approach for an integrated dynamic cellular manufacturing system and production planning with unreliable machines. Applied Mathematical Modelling, 40(1), pp.169-191. Shirazi, R. and Frizelle, G.D.M., 2001. Minimizing the number of tool switches on a flexible machine: an experimental study. 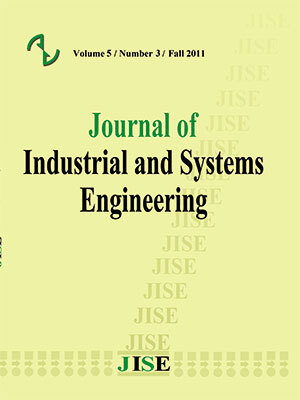 Proceedings of the Institution of Mechanical Engineers, Part B: Journal of Engineering Manufacture, 215(2), pp.253-261. Song, C.Y. and Hwang, H., 2002. Optimal tooling policy for a tool switching problem of a flexible machine with automatic tool transporter. International Journal of Production Research, 40(4), pp.873-883. Tang, C.S. and Denardo, E.V., 1988. Models arising from a flexible manufacturing machine, part I: minimization of the number of tool switches. Operations research, 36(5), pp.767-777. Turkcan, A., Akturk, M.S. and Storer, R.H., 2007. Due date and cost-based FMS loading, scheduling and tool management. International Journal of Production Research, 45(5), pp.1183-1213. Yanasse, H.H. and Rodrigues, R.C.M., 2007. A partial ordering enumeration scheme for solving the minimization of tool switches problem. In INFORMS ANNUAL MEETING SEATTLE (pp. 299-299). You, D. and Pham, H., 2015. Reliability Analysis of the CNC System Based on Field Failure Data in Operating Environments. Quality and Reliability Engineering International. Zeballos, L.J., 2010. A constraint programming approach to tool allocation and production scheduling in flexible manufacturing systems. Robotics and Computer-Integrated Manufacturing, 26(6), pp.725-743. Wang, K.S., Lin, W.S. and Hsu, F.S., 2001. A new approach for determining the reliability of a cutting tool. The International Journal of Advanced Manufacturing Technology, 17(10), pp.705-709. Wang, D., Song, C. and Barabási, A.L., 2013. Quantifying long-term scientific impact. Science, 342(6154), pp.127-132.